March was an yet another eventful for the Asgard Fencers where the Singapore Minimes Championships had everyone involved. There were 2 Age Categories (U-14 and U-12) as well as team events with the boys and girls separated. All of them managed to qualify and Alexis managed to attain a Bye into the next Direct Elimination round with the top ranking. The girls competently fenced against their opponents, many of them confidently dispatching their opponents. Calista also managed to brave through her match 15 - 14. Kirsten however was an unfortunate casualty in the round, eliminated 11 - 15 against the 11th-ranked fencer. Calista, Rebekah and Heidi lost in this round, with the latter two having had to fence against their Club-mates Megan Au and Alexis respectively. Maddy and Yu Qi were the other remaining two fencers who went into the Quarterfinals. Alexis put in an exemplary showing for her medal, beating her opponent with a 15 -2 score. Maddy and YuQi however both lost with 7 - 15 scores, with Maddy having met Megan. The Semifinals pitted Alexis and Christine Tan from YIF, one of the top fencers in this age category. Alexis and Asgard's run ended here however, with the score 8 - 15. Isaac had been fencing well, managing a run of good bouts in the poule. He had 3V / 2L, with both losses closely fought with 4 - 5 scores. James performed similarly with 3V / 2L as well to finish up the poule rounds. Post-Poules Isaac was ranked 17th and James 22nd. James had to fence off in the round of 64, facing SANG Wei Hao from Greendale Secondary School. He beat his opponent 15 - 2, showing some of his best fencing yet. James faced Chan Phu Xien from Singapore Sports School in the round of 32, and lost in a closely contested match 11 - 15. Isaac managed to Bye the first round and faced Tee Zong Ren of YIF in the Top 32. Although he built a 2-0 lead at the start, he was defeated 15 - 4. Many of the girls that participated the day before fenced in this event as well, with only 2 new additions. The girls were immediately in the Quarterfinals after the poules, only needing one victory away to guarantee themselves a medal finish. In the Quarters, Charis and Rebekah had the misfortune of being placed against each other with Rebekah coming off as the victor 10 / 5. Yu Qi & Kirsten joined her into the Semifinals. Ashley lost 4 - 10. Yu Qi now faced Rebekah in what was a fiercely contested match. The scores never differed from 2 points, and it ended in a climatic 10 - 9 victory for Yu Qi. The other semifinal ended with the same score, with Kirsten pushing through for the victory and a place in the finals. In the finals both fencers fenced to the best of their abilities and ended with Yu Qi winning 10 - 4. Having been ranked last, Jovern had to be in a fence-off for a spot in the Top 16s. Facing Jerome Gan from ZFF, Jovern managed to pull off a stunning 10 - 9 win into the next round. Bryan, Augustine and Emmanuel fenced well and comfortably sent their opponents on their way. 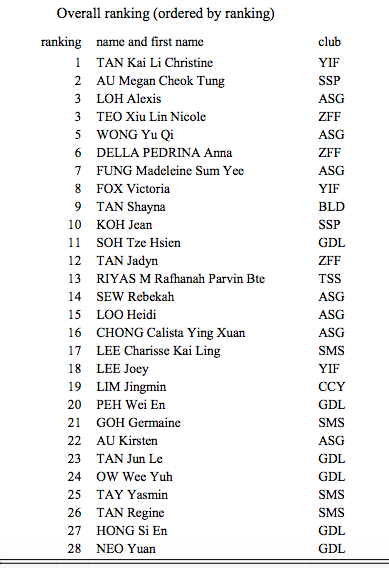 Jovern then faced the 1st-ranked fencer Dan Wei Zhuo in the Top 16s losing 0 - 10. Aidan and Ryan also met with tougher opponents, losing 2 - 10 and 1 - 10 respectively. The Quarterfinals saw two of our fencers Bryan and Augustine defeated 2 - 10 & 5 - 10. Emmanuel beat his opponent 10 - 5 to secure a Semifinal spot. He was however matched with the eventual champion, and lost 1 - 10.